The German was recently excluded from the matchday squad for the League Cup quarter-final versus Tottenham Hotspur due to tactical reasons and this raised question marks regarding his future with the club. However, ahead of the Burnley game, Emery has indicated that Ozil has the characteristics to help the Gunners with the festive schedule of fixtures underway. "I want every player with a good mentality to help us and give us their characteristics and quality. We need Mesut Ozil," he is quoted as saying by Arsenal.com. 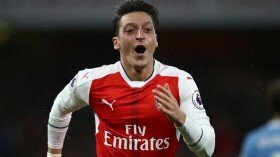 Ozil has failed to make a single league start for the Gunners since the last international break but he could feature from the off on Saturday with Henrikh Mkhitaryan ruled out with an injury. Aside from Ozil, Aaron Ramsey is another who could return to the starting mix with Alex Iwobi's position likely to be considered after his struggles to convert scoring opportunities.